When you think that the church has stooped so low and hit the rock bottom, they proved that they can be worse. 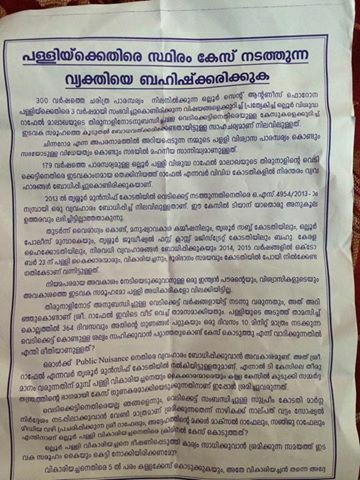 Below is the notice issued by church on last Sunday(20th Dec 2015) to all its followers and near by churches asking to ban me, my father and my brother from the society and church. Sadly these people don't know that banning people from society (ostracization) is a big criminal offense. And instigating and mobilizing crowd for these activities deserves punishment from Indian Law. 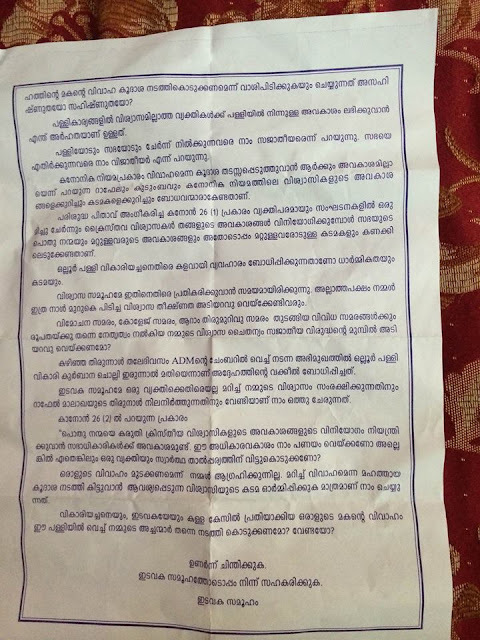 The priest during the holy mass asked the representatives of each family units to get these notices from the office and distribute to each family under them. The notice tells the believers that this fight is not against Rapheal but this is a fight for their christian belief and maintain Angel Rapheal's parish feast. Extremists of other sects should learn from our church on how to misguide the believers and exploit their belief systems. The notice is full of false allegations. I have clearly explained all those allegations in my previous posts. So I am not getting into that. I feel pity for the people who thinks that stopping my marriage is equivalent to fight for their christian belief. very good,proceed according to what u decided and as I said earlier,file a suit against them in the court,copy of all the documents such as protest march,notices and all . നിയമത്തെ നിയമം കൊണ്ട് എതിര്‍ക്കാന്‍ ശ്രമിക്കാത്തവര്‍ തങ്ങളുടെ നിയമലംഘനം തിരിച്ചറിയുന്നവര്‍ ആണ്. അതുകൊണ്ട് വിജയിച്ചുകഴിഞ്ഞ താങ്കള്‍ വര്‍ദ്ധിതവീര്യത്തോടെ മുന്നോട്ടുപോവുക.